Adam Scott won the Honda Classic at PGA National Golf Course in Palm Beach Gardens, Florida with some outstanding ball striking. He easily played the best golf for the week. He is considered to have the best golf swing in golf, so when he says he had a great ball striking week, then it must have been special. PGA National is probably the toughest regular tournament test of the year besides the US Open, British Open, and PGA Championship. With small modifications to rough and green speed, it would take very little to get it ready for a major championship. Since Adam Scott came on the golf scene in the early 2000’s, his swing has drawn praise and envy. He has not changed mechanics and fifteen years later his swing is virtually the same. Because of his swing and ball striking ability, he was destined for greatness and many major championships. Although he has made millions and won 29 times around the world, he has not fulfilled his potential based on his exceptional skills. He gave away the British Open in 2012, but finally won his only major the next year in a play-off at the Masters. But given his great skills and competing in 59 major events, be only has been in the top five 8 times in that stretch and missed 16 cuts. In the early 2000’s, Tiger Woods’ swing and Adam’s swing were nearly identical. The one difference was that Tiger could use his swing better then Adam. I have played PGA National around 20 times and have loved the challenge to have to hit quality shots on this demanding layout. It is fair, but difficult. If you can hit the shot, you will be rewarded. 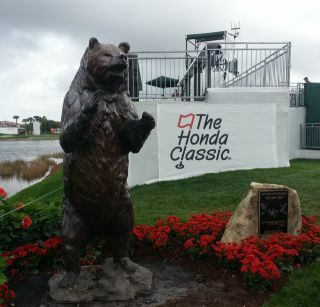 Except for this year, I have been in the gallery at the Honda Classic attending about eight times. I don’t get excited at watching the Tour pro’s hit on the practice range. I want to see them execute their shots in competition in demanding situations where there is a definite risk reward and a severe penalty for failure. At PGA National, you are confronted with numerous opportunities to have disastrous consequences. If the wind blows over 10 miles for hour, the course plays two shots tougher, but if it gets to 20 miles per hour, then it really gets scary. I have seen major champions hit terrible shots that you wouldn’t believe they were capable of doing. I watched Ian Poulter stand over a four iron shot at the 15th hole for 20 seconds before backing off, then readdress the ball and spend the same amount of time before finally getting the courage to strike the ball, which went 30 yards off target to the left of the green. I can only image what was going through his head and the many others that hit balls in the water on 15 and 17. Do good players choke? Absolutely, but that’s where the mental side of the game plays its’ biggest role. You don’t win over your fears every time, but the winners succeed more often than the also rans. Winners can forget their failures and don’t dwell on the negatives. Adam Scott struck the ball brilliantly on Sunday. Sergio Garcia didn’t, but only finished one stroke back after the pair was tied for the lead after 54 holes. So winning isn’t only ball striking, but when your ball striking is excellent, it overcomes other deficiencies. I have always felt that Adam Scott plays a game that I call “golf swing”. By that I mean he tries to make a physical swing to produce the desired result instead of feeling the shot and being more artful. There are degrees of being too mechanical and Adam Scott certainly has good feel and visual skills, but to me he relies a bit too much on the mechanical side. This, I believe, is why he hasn’t won more or contended better in the major events. Almost everyone would take Scott’s career record and swing. He is a gentleman on and off the course; has made plenty of money; and is a star attraction in every event that he enters. So criticism of his game is nitpicking. But everyone can be better and Adam Scott can certainly be better. There are flaws in all parts of his game, but I will only comment on his putting, which is the most noticeable. He was a below average putter before going to the long putter. With the long putter along with his unique stance and stroke, he improved his statistics. Those saved strokes made him a winner more often and a contender in majors. His putting was very mechanical with the long putter and made him a decent putter, but definitely not great. Now that the anchoring of the putter has been outlawed, he has reverted back to a more standard putter. He is using the same principles he used with the long putter, but modified them to accommodate the shorter unanchored putter. The stroke is mechanically sound and produces a consistent role. Watching him go through his putting routine, which features aim-point, I sense that it is a mathematical equation rather than an art expression. Aim-point and all the data he gathers should be used alongside his visual and feel skills to determine the best way to make a putt. I sense that when he makes his real stroke, the one that counts, it is a mechanical stroke and not one that has a lot of feel or visualization in it. Adam Scott will continue to be a factor for years to come, but he should take a lesson from Bubba Watson and not be so “golf swing” and “mechanical putting stroke” oriented. Bubba sees shots and feels them and doesn’t worry about how the body achieves the results. Scott has fantastic mechanics and golf swing, which should make his working “tool” better than Bubba’s. But golf doesn’t pay off on the best swing, but only on the best results. If Adam could trust more and visualize and feel more, he could use his great swing the same as Tiger did!